Arthritis is a common but painful condition affecting many people as they age. There are two types of arthritis; osteoarthritis and rheumatoid arthritis.Osteoarthritis occurs due to wear and tear of the joints, in particular to the cartilage, which acts as the ‘shock absorber’ of the joint, whereas rheumatoid arthritis is not known to have a specific cause, but many believe it is due to genetic factors or because it has been initiated by another condition.As there are many joints and bones in the foot region, it is an area that can become very susceptible to the development of arthritis. Often seen in the foot and ankle, osteoarthritis develops with age and is characterised by joint stiffness, pain and swelling of the affected area. As the cartilage degenerates, the bones are more likely to come into direct contact with each other causing them to rub together leading to inflammation. This inflammation can be very painful and often cause the person to develop reduced mobility. 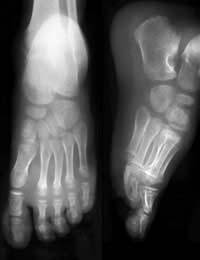 For those with either flat feet, or extremely high foot arches, the chances of developing osteoarthritis is greatly increased, as are those who have suffered some degree of trauma to the foot or ankle. Fractures, sprains or other injuries can all contribute to the degeneration of the cartilage of the joints. There are many treatment options available for sufferers of osteoarthritis, though these can only act as measures of relief, the condition cannot be cured, only managed in a way to try and prolong normal activity with as little pain as possible.These options include the use of medications such as pain relief or anti-inflammatory medications; paracetamol contains both pain relieving and anti-inflammatory properties and may be sufficient in the early stages of the condition.Shoe inserts may provide beneficial relief of pressure and pain experienced whilst walking or when wearing shoes. These can be found in a variety of shapes and sizes so please be aware of all types of these devices when wanting to purchase them.Preventing movement of the foot can allow time for inflammation to subside, and this can be achieved by wearing a plaster cast of the foot and ankle. This can only provide temporary relief from the symptoms. Occasionally, steroid injections may be the treatment of choice as these allow for drugs containing anti-inflammatory properties to be injected directly into the affected joint. They do not work for everyone, but for those who are fortunate to feel their benefits, they can be very useful at reducing pain and this relief may last several weeks at a time.Physiotherapy may also prove useful, as by strengthening the muscles, ligaments and tendons surrounding the joints, support for the joint can be built up allowing for a stronger frame from which normal activity may be possible for longer periods of time. There are also many herbal and alternative therapies available for the relief of arthritis. These include plant extracts and fish oils which all have proven benefits of reducing inflammation and pain, but by also lubricating the joints. Many believe these products are best taken as a preventative measure, usually daily to help prevent or delay the onset of the disease. Often seen first in the foot and ankle, rheumatoid arthritis can affect many joints of the body and is thought to be triggered as a response to external factors or existing diseases.Symptoms include pain, swelling and stiffness along with gradual deformity of the joint resulting in the possibility of developing flat feet, hammer toes or noticing that lumpy tissue is growing around the affected area. Blood tests, x-rays and examination by the doctor will aid the diagnosis of this condition and treatments can range from a variety of medications to reduce the inflammation, surgery to correct deformity, the application of orthotic foot devices and modification of footwear to the most important factor, exercise.Physiotherapy can greatly improve the condition and prevent it from deteriorating as it is vital to keep the joints mobile and functioning as much as possible. Arthritis of the foot and ankle can be very painful for the sufferer. It is important to obtain an accurate diagnosis in order to plan treatment to help reduce the severity and development of the condition.